In the UK Civil Service, there is 1 Human Resource professional for every 50 employees. In other sectors with some degree of standardisation, larger organisations should be achieving a ratio way beyond 1 HR professional to 100 employees. The report indicates that HR in the UK Public Sector is about half as efficient as it should be. The UK Government has presented its strategy for delivering efficiency savings in the Public Sector, Putting the Frontline First – Smarter Government and states that "This plan delivers better public services for lower cost". The report refers to a range of tactics including strengthening the role of citizens and civic society, accelerating the move to digitalised public services, allowing local authorities to create further commercial opportunities and streamline central government for sharper delivery. The report also highlights the objective of improving back office processes to the standard of the best. To make the proposed Public Sector changes, and make them stick, requires effective people management and HR has a key role to play in this. As "Next Generation HR" – the Civil Service wide employee framework recognises, it is key that performance improvement, engagement and wellbeing, competencies and skills and smarter workforce deployment are delivered more effectively. The key to "Putting the Frontline First" is "Putting employees first" – they ultimately will deliver these changes. In the report Benchmarking the Back Office IT, Finance and HR metrics have been published for Government departments. The tactic of "Naming and Shaming" with benchmarks can be a useful and powerful technique when used appropriately. However benchmarking alone should never be used to size any function, it is a crude yard-stick. 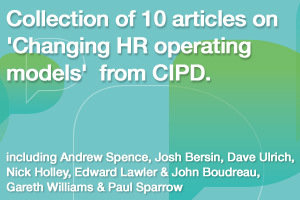 Sizing HR functions should be linked to the wider organisational goals. The question should not be "how do we achieve 1:77 or 1:150? ", rather "what are the goals of the organisation and what HR capability and resources do we need to deliver them?" Armed with this benchmark data, Click here for spreadsheet with HR Benchmark Data (with Glass Bead Consulting Ranking), the HR Transformation Analyst team at Glass Bead Consulting were let loose for some initial number crunching. The data, at this stage, has too many questions and gaps to be analysed in a meaningful way, but here are some comments and observations. 1. The data shows '% Cost of HR Function' (against total running cost) and 'Ratio of Employees (FTE) to HR Staff', plus Average Working Days Lost to Sickness (AWDL). 2. Using Benchmarks is a minefield with many reasons for anomalies. It is often a more productive use of time to work out why there are differences within an organisation. The metrics chosen have their flaws, for example the Ratio of Employee (FTE) to HR Staff might show variations due to degree of outsourcing and definitions. 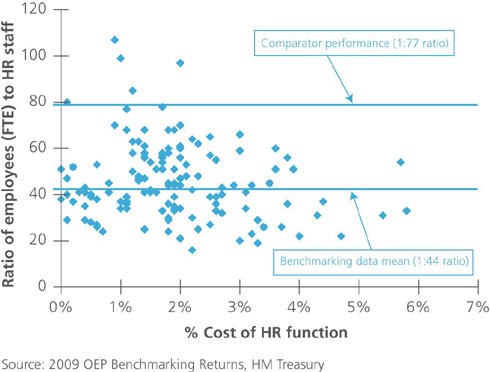 '% of Cost of HR function' will vary considerably depending on the type of expenditure i.e. running Embassies around World or calculating benefits payments. 3. In terms of HR metrics, we prefer the 'Total Cost to Serve per employee' metric as it reflects 3rd party spending and relative salary costs. E.g. the HR : Employee ratio might be very high because 50% of HR is outsourced, however the 'Total Cost to Serve per employee' allows a better comparison. 4. It would be useful if the report published "number of employees" and "number of HR Staff" – then the departments could be grouped into similar size. An organisation with 500 employees clearly has less options for economies of scale and skill, not to mention investments, than one with more than 20,000. 5. Why are there gaps in the data? These are the most basic data elements you would look to in a HR Assessment. How many employees do you have and how many HR staff? Why is this so difficult? 6. The document mentions, 1:77 (see graph below), as an private sector industry median performance. However, in a recent discussion in the CIPD LinkedIn community, there was general agreement that 1:100 is a sensible starting point. Larger Private Sector top performers are way beyond 1:100, with the use of shared service centres, Employee & Manager Self Service tools, effective use of 3rd parties, and re-allocation of people management responsibilities. 7. Why include Sickness (AWDL) as a metric here? Although there are correlations between effective HR and this is an important metric, it is one of many goals. Managing sickness is not solely HR's job – it is also the mangers responsibility. However important Sickness is, it is a distraction in this context. 8. Where is the NHS data? The NHS should be much further ahead than other Government departments following the large investment in ESR (HR Oracle based system) which has now been implemented. Having a common HR System is a key building block for more efficient Shared Services. It is important that NHS data is included to get a baseline from which regional shared services can now start to be planned. Even with a target of 1:77, the figures above show there is a long way to go. As Rick, from Flip Chart Fairy Tales asks, in Government support functions: over-spending and over-staffed, what does this tell us about the efficiency of the Civil Service as a whole? If an organisation is delivering at 1:20 or even 1:40, it is not delivering HR effectively. I would go as far as saying 1:100 has been the litmus test for organisations if we are going to use crude benchmarks. The scope of the report doesn't tackle how well HR does in terms of helping organisations achieve their objectives (which is why HR exists). Better links need to be made between progress on 'Next Generation HR' and ongoing Benchmarking reporting. Any plans to transform UK Public Sector needs strong leadership, robust performance management, employee engagement and the right competencies and skills deployed at the right time. In other words a well functioning, modern HR department. Reporting the key HR Metrics is a fine idea and good starting point. However it is important that the right metrics are assessed and any decision-making framework includes a much broader set of a data so that meaningful targets are set and delivered. This entry was posted on Tuesday, December 8th, 2009 at 3:00 pm	and is filed under Change Management, HR Benchmarks, HR News, HR Operating Models, HR Strategy, HR Transformation. You can follow any responses to this entry through the RSS 2.0 feed. You can trackback from your own site. I always enjoy finding a site with interesting content please keep updating information and I will be a regular visitor.